In test tube studies garlic has been found to have antibacterial, antiviral, and antifungal activity. However, these actions are less clear in humans. Garlic is also claimed to help prevent heart disease (including atherosclerosis, high cholesterol, and high blood pressure) and cancer.Animal studies, and some early investigational studies in humans, have suggested possible cardiovascular benefits of garlic. A Czech study found that garlic supplementation reduced accumulation of cholesterol on the vascular walls of animals.Another study had similar results, with garlic supplementation significantly reducing aortic plaque deposits of cholesterol-fed rabbits. Another study showed that supplementation with garlic extract inhibited vascular calcification in human patients with high blood cholesterol.The known vasodilative effect of garlic is possibly caused by catabolism of garlic-derived polysulfides to hydrogen sulfide in red blood cells, a reaction that is dependent on reduced thiols in or on the RBC membrane. Hydrogen sulfide is an endogenous cardioprotective vascular cell-signaling molecule.though these studies showed protective vascular changes in garlic-fed subjects, a randomized clinical trial funded by the National Institutes of Health (NIH) in the United States and published in the Archives of Internal Medicine in 2007 found that the consumption of garlic in any form did not reduce blood cholesterol levels in patients with moderately high baseline cholesterol levels. According to the Heart.org, "despite decades of research suggesting that garlic can improve cholesterol profiles, a new NIH-funded trial found absolutely no effects of raw garlic or garlic supplements on LDL, HDL, or triglycerides… The findings underscore the hazards of meta-analyses made up of small, flawed studies and the value of rigorously studying popular herbal remedies." In 2007, the BBC reported that Allium sativum may have other beneficial properties, such as preventing and fighting the common cold. This assertion has the backing of long tradition in herbal medicine, which has used garlic for hoarseness and coughs.The Cherokee also used it as an expectorant for coughs and croup. Garlic is known for causing halitosis as well as causing sweat to have a pungent 'garlicky' smell which is caused by Allyl methyl sulfide (AMS). AMS is a gas which is absorbed into the blood during the metabolism of garlic; from the blood it travels to the lungs (and from there to the mouth causing bad breath, especially if one belches) and skin where it is exuded through skin pores. Washing the skin with soap is only a partial and imperfect solution to the smell. 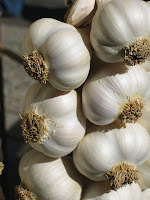 Raw garlic is more potent; cooking garlic reduces the effect. The green dry 'folds' in the center of the garlic clove are especially pungent. The sulfur compound allicin, produced by crushing or chewing fresh garlic produces other sulfur compounds: ajoene, allyl sulfides, and vinyldithiins. Aged garlic lacks allicin, but may have some activity due to the presence of S-allylcysteine. Some people suffer from allergies to garlic and other plants in the allium family. Symptoms can include irritable bowel, diarrhea, mouth and throat ulcerations, nausea, breathing difficulties, and in rare cases anaphylaxis. Garlic-sensitive patients show positive tests to diallyldisulfide, allylpropyldisulfide, allylmercaptan and allicin, all of which are present in garlic. People who suffer from garlic allergies will often be sensitive to many plants in the lily family (liliaceae), including onions, garlic, chives, leeks, shallots, garden lilies, ginger, and bananas.